Finish@Coil E1 is one of the most easy-to-use coil finisher that you can find in the market today. It is designed with one goal in mind… providing the maximum productivity & best results while requiring minimum efforts from the operator. With its adjustable full-size rollers, this high-capacity electric coil inserter makes coil inserting extremely fast and easy, even on the extra-large diameter sizes. 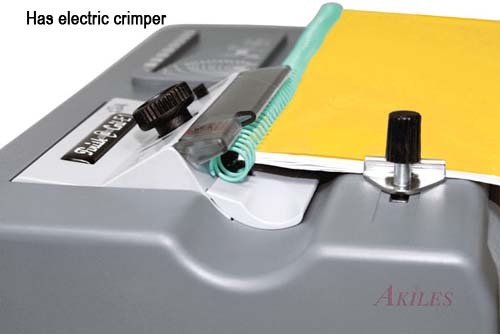 Furthermore, the built-in electric coil crimper will make your coil binding experience easier and faster than ever. Forget about using the cumbersome manual coil crimper that tires your wrist. With the Finish@Coil E1, you will easily & quickly crimp off the excess coil in your book with a simple press of foot pedal. The Akiles Finish@Coil E1 is ideal for operators that demand maximum productivity & best binding results, with minimum efforts. 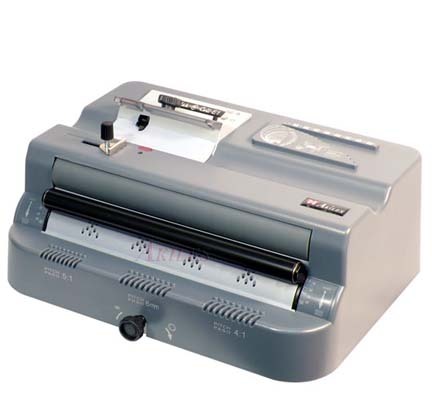 It is a must for all binding centers with large workloads. Full Length Roller with Adjustable Roller Mechanism: 11-3/8" EPDM roller provides high friction and durability (Foot-pedal operated). Adjustable bottom roller makes it easy to insert coils of different sizes, even the extra-large ones. Built-in Electric Coil Crimpers: Provides consistent & perfect crimps on all coil sizes up to 50mm with a simple press of foot-pedal. Avoid using cumbersome manual crimpers while saving your time and wrist fatigue. Foot pedal operated. Syncronized Roller/Crimper Adjustment: Makes it easy to set the correct roller position & crimper angle on the machine for different coil sizes. Adjustable Crimper Head Mechanism: For perfect crimp result in all coil sizes, without the expense & hassle to purchase/install different crimper heads. Foot Pedal Operation: Allows the free use of both hands and grants the operator complete control while inserting or crimping the coil. Manual Operation Mode Switch allows the operator to choose between “Insert” and “Crimp” action when foot pedal is pressed. Automatic Mode Selection Sensor: With this innovative feature, operator can set the machine on AUTO mode, which automatically switches foot-pedal operation between “Insert” and “Crimp” by its built-in sensor. Built-in Coil Diameter Scale: Helps to verify the coil diameter size. Built-in Coil Diameter Selector: To best select the correct coil diameter size corresponding to the thickness of your document. Built-in Pitch identifier: Verifies that the coil pitch matches that of the punched document. Built-in U-shaped Alignment Channel: Aides in conforming the spine of larger diameter documents to the coil’s shape, for a faster and easier insertion. Binding Capacity: Up to 50mm (1-7/8)"
FREE SHIPPING COUPON for this item in the lower 48 states !